Margaret McNamara, (in window), her sons and daughters await the eviction party. In August 1903 the The Clare Champion published a table containing details of tenants evicted in East Clare between 1 January 1878 and 1 January 1903 to mark the passing of the Wyndham Act - the Land Purchase (Ireland) Act (1903). The Wyndham Act effectively ended landlordism in Ireland by enabling tenants to buy out their farms with British government funds. The Act was the culmination of land agitation throughout the 1880s and 1890s, much of it organised by the Irish Land League. 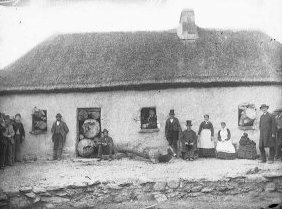 The Land League was particularly active in East Clare, as seen by its involvement in the Bodyke evictions. The 25 years covered by The Clare Champion publication corresponds to the period between the founding of the Land League – in 1879 - and the passing of the Wyndham Act. The terms ‘League’ and ‘Branch’ in the table relate to local Land League branches.